Run the Alps’ friend Matt Flaherty, a US-based athlete running for Salomon, recently came in fifth in the very challenging Eiger 101 race in Grindelwald, Switzerland, with a time of 12:30.34. 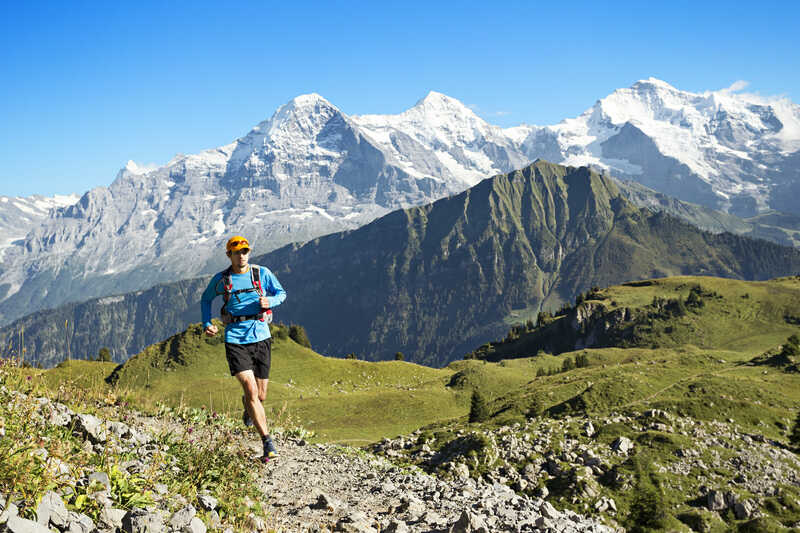 We talked to him about his race, and got a few tips in case you’re interested in tackling this course in the beautiful Berner Oberland region. Here’s what he had to say. Run the Alps: Excellent job Matt! To what do you attribute your strong result on the 101? Matt: I think a patient start and the fact that I’ve been able to get into the Swiss mountains for big weekends the last month. The latter provided me just enough climbing and descending specificity to make it through, but this was a stretch for me. It’s the longest I’ve ever run by 2.5 hours, and by far the most amount of vertical (6700m). The long mountain training runs gave me the strength to climb and the adaptations needed to handle (more or less) the several massive descents. But it was my conservative first third of the race – taking it easy, even recording an Instagram story, ha! – that allowed me to really capitalize on that training. With a race this long, you have to stay relaxed, even more than you think you need to, for a long long time. Run the Alps: What did you think of the course – was it what you expected for the difficulty? What about the general vibe and the setting? Matt: I think the course met my expectations, which were for it to be very difficult! There’s no getting around all that vertical. While there were some technical stretches, I found it to be pretty runnable for the most part. A few of the paved descents were less than pleasant, but so it goes. The vibe out on the course was great. All the spectators and aid station volunteers, as well as hikers out for the day, were really positive and giving the runners good energy. Run the Alps: Any tips or someone wanting to tackle the 101? Matt: To the extent you can, try to get in at least a few long, long days running and hiking in the mountains (6-8 hours or more). You really need this for the strength to tackle repeated +/- 1000-meter climbs, as well as for conditioning your quads to hold up under similar descents. Again, I think specificity is the name of the game, so try to mirror the race profile in training to some extent (i.e. roughly the same vertical gain per mile). Long climbs of an hour or more on stairclimbers or treadmills could also help, though watch out for your sanity. Beyond that, just make sure to start slower than you think you need to and take the time to care for yourself at aid stations. Spend that extra few minutes to make sure you’re getting enough calories and fluids. Run the Alps: What’s next for you? Matt: I’m headed to Sierre-Zinal, just four weeks after Eiger. I raced Sierre-Zinal last year too, and I loved it, so I’m very excited to be headed back. It’s quite a bit different than Eiger Ultra Trail of course, but Sierre-Zinal does begin with a pretty massive climb! So I’m sure the Eiger experience will help with that. After that first climb though, it’s speed that counts at Sierre-Zinal, so in the couple weeks I have to train, I need to focus on some quicker turnover. Then in September I’ll be running for Team USA at the 100km World Championships in Croatia. Again, quite different than Eiger, but I’m pretty indiscriminate in my racing. I find a lot of value and interest in pretty much every kind of running. Back in February, I was racing a 3,000-meter race on an indoor track!